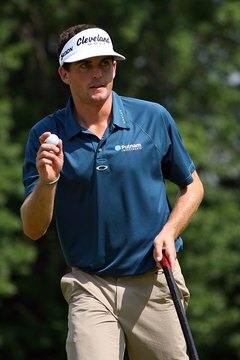 Keegan Bradley wears traditional men's golf attire at a 2011 PGA event: slacks plus a collared shirt tucked into his pants. For some, golf is a fun recreational game that may be played in casual attire, such as jeans or shorts and a T-shirt or other loose top. For others -- mainly country club patrons -- golf is a sport for ladies and gentlemen who should be dressed appropriately. PGA Tour officials tend toward the latter opinion, although Tour rules don’t expressly forbid items such as shorts or collarless shirts. The PGA Tour Handbook states: “Players shall present a neat appearance in both clothing and personal grooming. Clothing worn by players shall be consistent with currently accepted golf fashion. The tournament director shall interpret this regulation subject to the approval of the commissioner.” In other words, each tournament director may interpret the PGA Tour’s guidelines, although the Tour’s commissioner may have the final say. The dress code for the PGA Junior Series is more specific than the Tour’s code. The Junior Series code specifically prohibits “denim shorts, short-shorts, cut-off shorts, gym shorts, jeans.” It states that hats or visors may not be worn backwards and must be removed when the player is in the clubhouse. Collared shirts are required and they must be tucked in. Local PGA sections may establish their own dress codes, but some specifically adopt the PGA Tour’s code as the standard. For example, the PGA’s Illinois section states that male players competing in the 2012 Illinois Open Championship “will observe the dress code of the PGA Tour.” But the event’s website also notes that blue jeans, shorts, collarless T-shirts and tank tops are forbidden. According to the Michigan section’s 2012 tournament rules, men playing in state PGA-sponsored events may not wear “jeans and shorts, of any style, cut-offs and tank tops.” An exception for the ban on shorts is made for professionals playing in a few specific state tournaments. When PGA Tour pro Mike Weir wore a mock turtleneck to the Royal Montreal course in 2007, it was reported that he was refused entry until his agent purchased him a collared shirt at the club’s pro shop. The agent, Brad Pelletier, later denied the confrontation, stating that he made the decision to obtain a shirt for Weir that complied with the club’s rules. Forrest Fezler in 1983 became the first U.S. Open golfer to play in shorts. Fezler changed (in a portable restroom) from traditional slacks to blue golf shorts prior to the tournament’s final hole, then played the 18th in shorts to the applause of many spectators and fellow players. Fezler had stated publicly that he wanted to challenge the USGA’s unwritten ban on wearing shorts.